Deve Gowda stormed to power in 1994 and served two years as the Chief Minister of Karnataka. He resigned from his post after he became the country's accidental Prime Minister in 1996. BENGALURU: Janata Dal (Secular) supremo H.D. Deve Gowda on Monday said that his only regret was not completing full terms as Prime Minister of India and Chief Minister of Karnataka. In an exclusive interview with ANI, Deve Gowda said, "Yes, as a chief minister, I have not completed full term. As prime minister, I have not completed the full term. You go through the book written by TSR Subramaniam. In 10 months, all policies were framed. Telecom policy, national highways, Metro policy and how to fund it, Kashmir issue." He added that during his tenure, he had visited the North-East extensively - something which no other Prime Minister had done before - and that there was no communal violence in any part of the country, including in Jammu and Kashmir during his 10-month tenure. "Northeastern states, no prime minister visited all the seven states; I visited. Show me one communal rift, either in Kashmir or any part of the country. I want the dream, my country should live peacefully," he told Smita Prakash, in an exclusive to ANI. On being asked about the regrets that the JD(S) supremo couldn't do when he was the prime minister, Deve Gowda said, "Yes, there are several policies which have been formed in my government. Still, they have not modified; they are going on the same line. Delhi Metro, the issue is going on extending now. It is more than 12 years in cold storage. I asked my urban development secretary, bring it; I'll clear that." When asked whether the country gave due credit to his prime ministership, Deve Gowda added, "The media, first (laughs). No, I am not going to blame because I was not able to cultivate the media because I am (was) worried about the administration. Frequently meeting media, pampering and manoeuvring; I didn't do that." Gowda spoke with fondness about the Left parties who supported him in steps that he took as Prime Minister but he says that he did not project his achievements as much as he should have. He wasn't clever by half because it is not in his nature to be such, he says. What he could have done, in hindsight, he says is appointed more media savvy people. But with a wave of his hand he dismisses the thought as if it pains him too much to think of the past. He also ruled out a come back to Parliament in 2019, as he said he had no further political ambitions. Gowda says that his grandson will take the place that he had in national politics. "If I was 75 or 78 then I could have done something now but it is too late." The 84-year old says that he has been betrayed by many of his political friends in the past. He mentions Ramakrishna Hegde several times in the conversation. It remains a regret that he couldn't iron out differences with the other tall leader from Karnataka politics. Admitting that he had lost a lot of friends during his time in politics and life, the octogenarian said, "Hegde was a leader. I don't call Siddaramiah as my (state's) leader. J.H. Patel, (S.) Nijalingappa jee. See there are many, (former Vice-President B.D) Jatti, they are all gone. My political guru is A.G.
Ramachandra Rao, who was a Cabinet minister in (K.) Hanumanthaiah ji's government. Hanumanthaiah is a good administrator. I have seen all these people." In the evening of his life, Gowda recalls many of his colleagues works in the present tense. As if they are still around. But at the end of the sentence....he sighs and says "they are all gone." "(Former Prime Minister) Chandrasekhar. I am not going to (sighs) I don't have any reservation on that. Harkishan Singh Surjit is (was) very great in 10 months. Let me be honest, if Karnataka people have voted 10 MPs, I would have become Prime Minister again. I. K. Gujral was my foreign minister. We are (were) very good friends. Even Chandrababu (Naidu) has not harmed me. Left parties were near to me," Deve Gowda added. He has no happy memories of interactions with any of the leaders of the Congress party other than Mr P.V. Narasimha Rao. "He was alright" is the only thing that Gowda could muster up. About Rahul Gandhi, Gowda says that the Congress president has no idea about what the Congress party's links are with other parties and he tends to shoot his mouth. Speaking about Rahul as if he is a teenager, Gowda says that Rahul has a tendency to mouth whatever is told to him. He has a long way to go before he can mature into a leader, says Gowda. Commenting on the four-year rule of Prime Minister Narendra Modi, the former Prime Minister said, "Only one thing I have to say. The graph that was there (up) when he took charge of the prime minister, it is slowly going down and he also knows it. That is all I can comment. The euphoria he has created is slowly coming down." 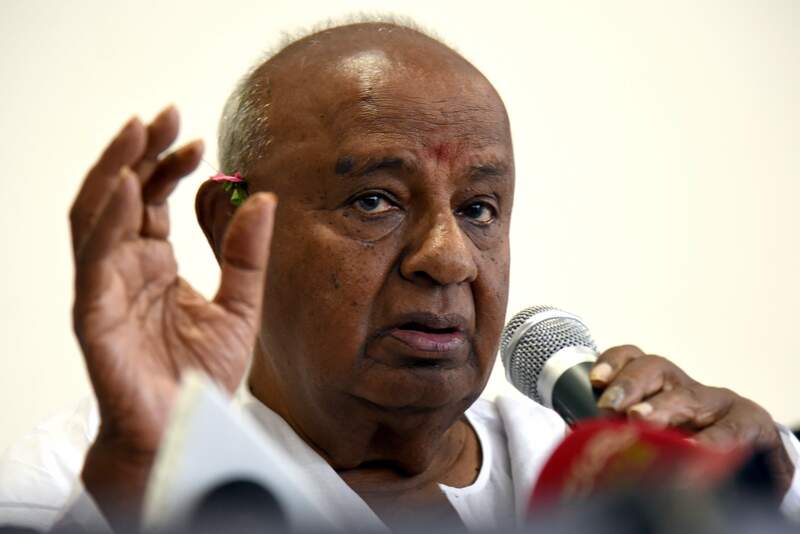 When asked if he would have got a huge mandate as that of Prime Minister Modi, Deve Gowda said, "I have already done what I can with the 13-party coalition. Who went to Kashmir? In 10 months and 10 days, five times I have gone there (Kashmir). What are all the facilities that are created? infrastructure, power projects, highways, railways, universities, loan waiver. Was there any trouble in the Valley or anywhere when I conducted the elections? 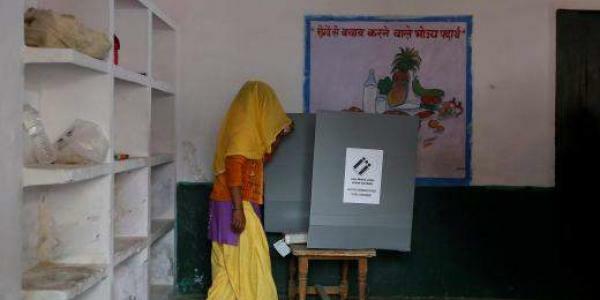 When the parliament election was conducted (in Valley), it was 2 percent votes, and when the assembly election was conducted, it was 52-58 percent votes." Asked whether if Prime Minister Modi asked him to join in the coalition, the JD(S) supremo replied that he had no political ambitions, adding that he doesn't want to be part of any anti-BJP or anti-Congress front. He would certainly meet anyone who came to him for guidance on how to go about forming political coalitions but he wants to be no part of any, he says. He further underscored that the issue of polarisation of communities in the upcoming Karnataka assembly elections would remain to some extent. He feels that successive governments have not empowered communities and castes through legislations which have been pending, as a result there is discrimination and discontent in the state. Dismissing claims that the patriarch is working on permutations and calculations to make his son H.D. Kumaraswamy as chief minister of Karnataka in the event of his party being the deciding factor in a hung assembly, the JD (S) supremo said that he wanted his 'regional' party to survive and that is his biggest goal. If Kumaraswamy becomes Chief Minister it would be his luck says Deve Gowda. Speaking on the language issue, Deve Gowda explained, "Hindi is a national language and we must accept it. There are 14-15 languages recognized. There is nothing to hide. I am proud to be a Kannadiga, but the point is when we are going to decide on the several issues in the parliament. See more than 60 percent of people speak in Hindi and South Indian people, we have own language and there is English, the communicative language. Even Hindi, we are not resisting. Three language formula was already accepted. The primary school and middle school curriculum is already there. Even Hindi, it's not compulsory. The student themselves choose to learn Hindi." On being asked about his concerns for Karnataka and the country, he noted, "Kaveri issue is pending. The fight is going on. Hunger strike; ministers and chief minister. People's issues still worry me 100 percent." The assembly election will be held in Karnataka on May 12, 2018, in all 224 constituencies of the Karnataka Legislative Assembly. The counting of votes and announcement of result will take place on May 15, 2018.